About Me: My name is Jessica. I live and work in the New York City metro area. I’ve been writing weekly fragrance reviews for Now Smell This for the past nine (!) years, as well as occasional guest posts at Blogdorf Goodman. About Tinsel Creation: This blog is a space for me to gather all my internet musings beyond perfume reviews, especially my thoughts on the interesting points where beauty and fragrance intersect with art, literature, and culture. About the name: The phrase “tinsel creation” comes from from a poem by Florine Stettheimer, one of my favorite artists. I like this phrase because it combines something frivolous with something serious. You can read the entire poem here. Product review policies: I only review products that I’ve personally tried. I do not accept any payment for mentioning or reviewing a product. For every product review, I will note the source of the product (e.g., purchase, gift with purchase, store sample, press sample). Comments: In order to post a comment, you will be required to enter a user-name and an e-mail address. Your first comment will be held for approval. I will not share your information with anyone else. 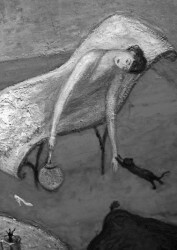 Image: Florine Stettheimer, detail of Heat (black-and-white photo), 1919, The Brooklyn Museum. I’m an art historian too and I just wanted to say how much I like the Stettheimer detail! I’m such a fan of hers. Thank you, Hilary! She’s been one of my heroines for a long time. This is awesome, Jessica!!!! So proud of you and can’t wait to read more!! Each review is stimulating and interesting and…different! Do you have a top 3 best perfumes…can u it down? I would love to know. I love your style!